Everyone loves to get better gas mileage, right? I sure do. Here’s a very simple way that doesn’t cost a cent. 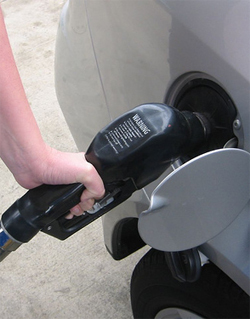 When You are pumping Your gas, hold the nozzle and pump slowly. Slowly as You can. That’s not the most important part. The key is to put Reiki into Your gas tank with the gas. If You know the symbols activate them. Just let the Reiki flow from your hand into Your car’s tank. If You don’t know Reiki at all, just imagine golden energy coming into Your crown and down through Your heart into Your hands. At the same time imagine gold energy coming up through Your feet from the earth and connecting with the gold energy You’re bringing down from Your crown. Imagine this golden light filled energy going into Your tank from Your hands. You can also imagine the golden energy along with the Reiki too. Now, don’t be shocked if Your car acts a bit funny, a little sputter or two, after You start driving with Reiki filled gas. Your car needs to get used to it. For you logical minded people, like me. Keep track of Your gas mileage. I usually get a couple of miles per gallon better by adding Reiki to the gas. Another added benefit to this technique is getting gas becomes quite a blissful experience. I rather enjoy it. I hope You do too. Let me know when You try it.